Mrs. Selzle, owner of Pfützenläufers Ares (Xaver) was so kind and wrote us an update about Xavers health. We are very happy that Xavers medication works that good and thus his condition is stabilized. You can find the short report from Xavers owner here. Now, we have a guest-book on our homepage! If you want to leave us some nice words or some greetings feel free to write! We look forward to all the entries. You can find the guest-book right here. Today, we like to show you visually how a TVD looks compared to a healthy tricuspid valve using ultrasound and the color doppler ultrasound. The four videos with explanations can be found here. We included the small, but subtle sub-point 'further important issues' on our homepage, since we meet again and again people with dogs – same as with ours – whose diseases do not get the attention they need. To support them in their engagement we will link their homepage here. Plus, we do not want to hide that we get support from breeders more often, which is something we are very glad and happy about. 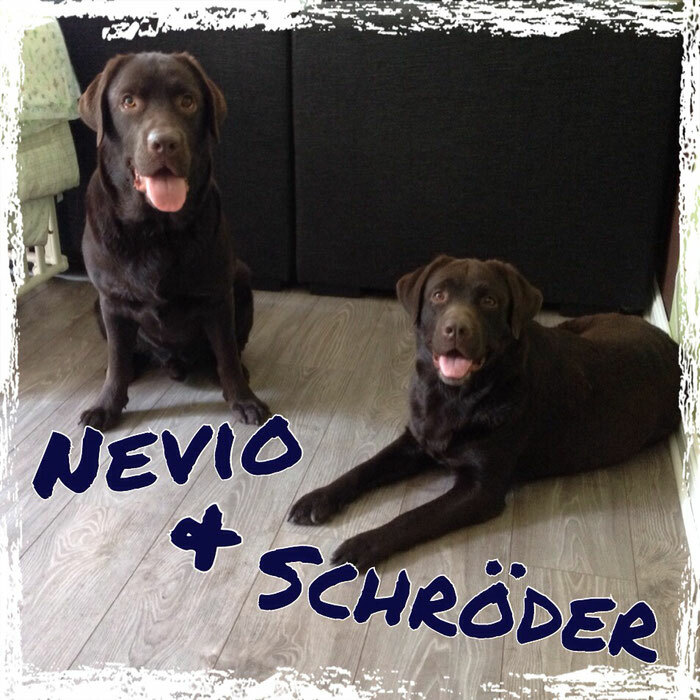 Finally, Nevio and Schröder – brothers in spirit – met for the first time. We hadn´t had that much time together, but the two got along very well! Nevio is much taller and longer than Schröder and thus has more weight to carry. They differ in roughly 6cm shoulder height, around 15cm body length and almost 10 kilo body weight. Nevios blood system has much more work to do in order to supply the whole body with blood. Accordingly, Nevio shows much more and stronger symptoms – especially on warm, hot days – than Schröder and needs some rest more often. In spite of the disease they are both very happy and playful dogs. Without their well working medication this would probably look very differently. Our associated cardiologists confirm that. We added 'Illustration of cardiac enlargement via chest X-ray' to the chapter 'tricuspid valve dysplasia - What is that?'. You can find the radiograph with explanations here (subsection 6). Today we like to inform you about the status quo of the study we plan. 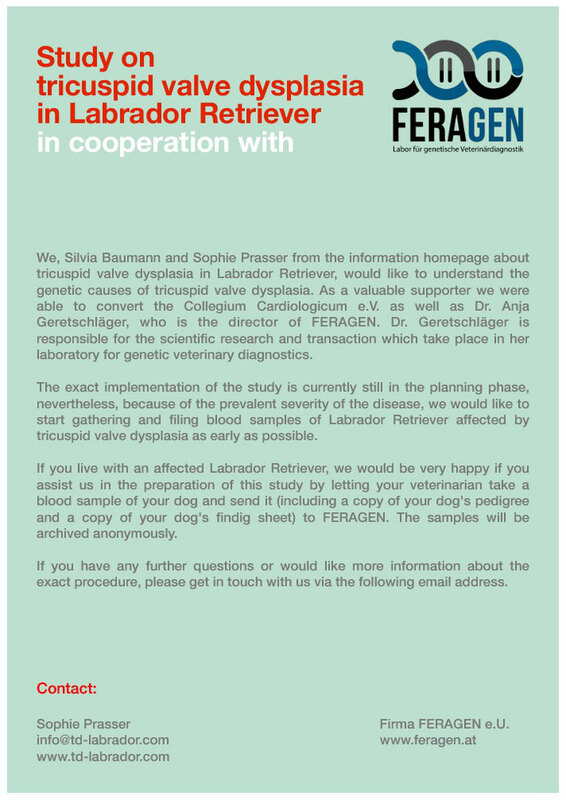 Dr. Anja Geretschläger from the institution of genetic veterinary diagnostic FERAGEN informed us about the status of planning and preparations. She also told us that at least five more blood samples from affected dogs are needed for primary analysis. Thus we like to ask again to participate in this study! Please share this announcement as widely as possible. But we start from the beginning: before Schröder became part of my life, we had a tomcat. He lived with us for almost 15 years. During this time he needed medical care due to some rivalries. When he was older, he got some chronic diseases like diabetes and acute renal failure. During all those 15 years, I guess he cost my parent an equal amount of a small car. Why do I tell you this? For one reason: it was clear to me that whenever a dog is moving in with me, I will make sure that he is covered with a health insurance as best as possible. And that's what I did. When I got Schröder I was still a student. I knew that I was able to pay for him on a daily basis, but I also knew that if something would happen, like a severe disease or an accident, I would have to hand out my last coins for him. That's why I decided to get the exclusive-protection from Agila, the best protection with highest monthly payments. Of course I hoped that Schröder would just stay healthy and the money would be uselessly thrown out. But it was worth it, since I knew whatever happens I do not need to give my dog away. No one expected that only five months later everything would look totally different. The vet diagnosed TVD although my puppy was totally healthy otherwise. This diagnosis was a total shock for me and of course, I was relieved that a least some part of the expensive medication would be covered by the insurance. The annual upper limit of 1100€ are already covered by Schröders examinations and medications for his sick heart. Any further troubles have to be paid by myself. That was ok, since I got the most important treatment covered without taking any loans. Well, and now? Now Agila canceled our contract to the end of the year. Of course, they offered an alternative rate, but this was not worth a chronically ill dog -who could only be operated with full anesthesia, if he dies without this surgery. * Now, we do not have an alternative but save the amount we paid Agila monthly and add the extra money for the treatment whenever needed from our own money. Same happened to Nevio and his owner. They also have to pay the constant high prices for the treatment by their own. We are both very angry and above all disappointed, because we assume that this is a way to get rid of chronically diseased animals. The price for exclusive-protection for a healthy dog of Schröders race/age is now 65,90€ and would have been a good alternative solution. But they did not offer that to us (instead we got a not helping "normal" health care). We will probably not be allowed to get this, since it's part of the contract that the dog must be younger than 7 years and HEALTHY. This strengthens the impression that they simply want to get rid of old and sick dogs (since everyone else is able to get this exclusive contract). Today we like to get some stuff off ours chest, because the reactions concerning our activities here are diverse. We get much support concerning our work from other concerned dog owners and from Collegium Cardiologicum e.V.. People interested in puppies are glad getting information from us and raise a lot of questions. FERAGEN is willing to collect and keep blood samples for future analysis to test the reasons for this disease. Other owners of Labradors, some future owners as well as breeders recognize the importance to better control the health of the heart in this race. Gladly there are breeders who willingly – partly with the whole kennel – get an ultrasound examination beforehand. We also get resentment and mean words. Especially from breeders, who feel accused by our information we collected. We get insulted, are excluded from some forums, breeders refuse to take out information about affected generations. Just recently we got threatened to be sued. Further, there are no reactions from LCD or DRC, nor any shown interest in helping us doing research about TVD, although it would be most easy to support us by linking this webpage or call for support for the study. All together this does not help to keep this race healthy. Quite the opposite, it makes dog owners support more insecure. Also that the list of affected dogs is quite small is taken as an argument against the importance of TVD. But it is not in our hands how this list is growing and the before mentioned activities and missing support is not helping either. Breeders and clubs can take this as their personal victory. For Labrador Retriever and future puppy owners it is a hard defeat to see how little the people responsible care about this topic and how little support and cooperation we get from affected owners, breeders and associations. We started our activities in support of the Labrador Retriever race – to keep the race healthy, to inform future owners and people who are generally interested in Labradors. We are 'only' two puppy owners, who wanted to buy a healthy dog with a steady nature. Personally, we did not need this activities. Our dogs are already infected and no current research can help them. We still believe that it is the responsibility of the VDH (German organization for German dogs), the LCD (Organization Labrador Club Germany e.V.) and DRC (German Retriever Club) to react together with breeders and work against often appearing diseases and genetic dispositions. We will still communicate this, with or without their support. It is simply frustrating and disappointing to realize that the health of the dogs and finally also those of their owners is not the main goal of those associations, apparently. Still, we will engage altruistically and keep our idealism! Bysterstorff's Beam me up Schröder is getting 3 years old today. And that he is breaking the record at Dr. Kattingers doctor´s office is again a sign of how lucky we are. Schröder is quite jolly and in spite of the TVD he keeps his tail up! But it could be quite differently: he could lie in a corner, lethargic and powerless, that's what the ultrasound pictures suggest. It is not a matter of course that he is still alive! This is why we please you: do not take the TVD as an easy thing! Please let your dogs be examined preventatively. We won´t even think about where Schröder would be now if we would not had this disease detected by chance. We wish more than anything else that Schröder will have many more years in such a happy and jaunty shape! Because we were asked several times how one can minimize the chance of an TVD to occur, we added another chapter about this topic, which you can find here. Nice Guy Nevio of Cadillac had again a control examination. The update to his health report can be found here. The VDH published a special about health of the heart in dogs in the current volume of the magazine 'Unser Rassehund'. There, Dr. vet. Jan-Gerd Kresken wrote an article about "Heart diseases in dog populations". In a small paragraph he also writes about TVD in Labrador Retriever. "Zuchtprogramme zur Bekämpfung von Herzerkrankungen"
"... I spoke with my very engaged team about your suggestion to publish a report, which will be added by yourself with facts about TVD. At the beginning I thought it would be a great idea, but now I think we better cancel it. Also the others think this way. What should I write about, besides me being very depressed: I bought a puppy directly from the LCD, from the beginning on the puppy was ill quite often, they diagnosed TVD with 9 months, now I lost so much money to examinations, treatments, medication... support from anybody: zero. Breeders, owners of stud dogs, LCD, they all kept hidden. Hour-long strolls? Nothing. Summer? Only between 5 and 7 in the morning, the rest of the time I need to check how I manage to get my dog through the heat and sun. Seriously: This miserable story how my life is with this dog, I do not want that in black and white. But I decided to change my frustration into action and I found other concerned people who put even more effort into this topic than I do. Of course, there are also positive examples, like Schröder who does not show any signs of lacking condition. But there are also those cases where the dog just drops dead. I already heard it from my vet: "You can euthanize your dog right away, I did that with dogs who had way less bad findings.". There are several dogs on our list who were euthanized. Thanks, I got it. We installed a blog, created flyer, we are in contact with the CC, with our cardiologists, with associations abroad, with breeders, with other affected dog owners. Mrs. Prasser could move FERAGEN to conduct a study and to collect material for that. And we decided: That's how we do it. The Collegium Cardiologicum e.V. linked our webpage about TVD on their own, you can find it here. We are very happy about that! We are very thankful about any help we can get, and would be very happy to be linked to other homepages and blogs. The perfect banner for that can be found here.